Hautelook has been having so many amazing beauty sales lately, and this morning I was shocked to see so many gorgeous Illamasqua products available. The prices are absolutely amazing, and in some cases up to 80% off. If you love Illamasqua, then you really need to check out this flash sale! Check out the amazing deals here! Such a great deal, I wonder if they are re branding! The prices are crazy! I don't think that they are rebranding because their website looks well stocked. If I had to guess, I would think that this is probably surplus product in the US after they pulled out of Sephora and Bloomingdale's. I sure wish that they were still at those locations! I just came back from looking on Hautelook. A lot of stuff is "on hold", whatever that means, and quite a few things are sold out. Nevertheless, there's still a lot left. I saw a cream shadow that I love, but I hate to pay Hautelook's expensive shipping costs for a $14 eye shadow. Ah, #beautybloggerproblems! I'm not surprised. I suspected that this was going to be one smoking hot flash sale! Their cream shadows are wonderful! I don't blame you for not wanting to pay shipping on a single eyeshadow! I saw this and I couldn't believe those prices! It makes me wonder if they're going out of business soon because they've been relatively low key lately. Hi Brianna, It doesn't appear that they are going out of business because their website looks quite active. My guess is that this flash sale is surplus produce left in the US after the company pulled out of Bloomingdale's and Sephora. WOW That is an awesome thing right there! I'm so sad Illamasqua isn't at Sephora and Bloomingdale's anymore. Crazy prices, too! You and me both! It was such a sad day when they stopped selling at those two stores! I love Hautelook but I've never tried Illamasqua before- maybe now I will! Hautelook is awesome, and Illamasqua is definitely a fab brand worth trying! It a fantastic brand from the UK. I took advantage of this! I suspected that you would, Courtney! The deals were insane! YESS!! I got some new brushes from the sale, even though I really wanted all the blushes lol When I was shopping so much was "on hold" so I'm sure lots sold out! Good choice grabbing some of their brushes! I wanted all of those blushes too! I'm not surprised that there were so many things on hold. This is definitely going to sell out! Illamasqua makes fabulous nail polishes. The last time they were on Hautelook I bought a lot of them. The price is so great on this sale. Their nail polishes are first rate! This is a particularly well priced sale too! I got to this sale too late and missed all the great lippies! So bummed! What a bummer! Hopefully they will feature Illamasqua again! I know, right?! This sale was just too good not to post! I saw the RBR sale as well! SO MANY TEMPTATIONS!!! Oh - hello to all the pretty... such gorgeous shades. 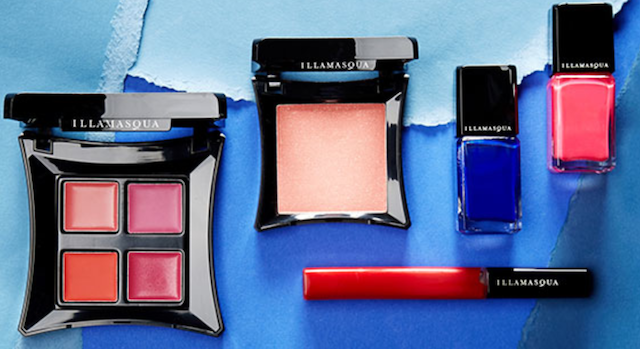 I haven't tried anything from Illamasqua before but I was eyeing the collection available on Hautelook today. Seriously true! Illamasqua is such an amazing line with so many gorgeous saturated colors! It's definitely a line worth trying! What a LOT of goodies! I have only tried Illamasqua nail polish and need to check out more of their products. Hi Renu, I have never been disappointed by any of their products. Their polishes are definitely amazing! I was very tempted to go shop crazy, but I was a good girl and didn't order. You really couldn't beat the prices though. What self-restraint! The prices were insanely good!